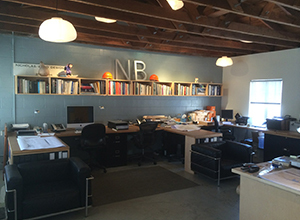 Nicholas/Budd Architects is a Los Angeles-based design firm offering architectural, landscape, and custom design services. Formerly of Nicholas.Budd.Dutton, a firm they established in 1999, Susan Budd and William Nicholas decided to take the firm in a new direction in 2007. The partners believe in the integrity of design as the most important contribution to the social and physical life of a place. Emphasis is placed on the integration of built space, furnishings and landscape. Our comprehensive approach is structured around the particular needs of each client, as well as the possibilities inherent in each project and place, such as context, climate, and site. Although the firm’s projects range in scale they always subscribe to this integrated design approach. We also believe in the importance of understanding the environmental impact of our work on the climate and landscape and developing projects with a focus on sustainability. We strive to go beyond a defining style in our work and to focus on the providing rich environments through varied materials, unique light qualities and well-proportioned spaces. William Nicholas has practiced architecture in Los Angeles since receiving his Master in Architecture degree from Harvard University Graduate School of design in 1992. He worked in various firms in Los Angeles and completed numerous residential, commercial, and retail projects. A native Angelino, William is trained as both an architect and a landscape designer. He has a strong attention to detail and a keen understanding of how people experience space. He specializes in creating spaces that integrate exterior and interior spaces. Sometimes the connection is established through views and light; in other instances his spaces meld together, blurring the line between inside and out. Outdoor terraces, pools, and garden rooms, as well as carefully selected and placed plant materials, augment the architectural experience. Susan Budd moved to Los Angeles after completing her Master of Architecture degree from the Graduate School of Design at Harvard University in 1992. She worked for various firms as well as collaborating with Bill Nicholas prior to the establishment of NBD Architects which has now evolved into Nicholas/Budd Architects. Susan is an architect with a subtle grasp of materials and details; she brings an elegant but balanced complexity to all our architectural projects. She excels at planning spaces; able to distill the complex demands of various components into a clear and comfortable organized plan. Her experience is diverse and includes all scales of architectural projects: from houses to housing, furniture to hotels. She maintains an understanding of the big picture while at the same time makes sure every detail is well-considered.